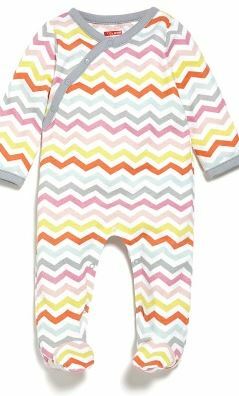 One Piece Side Snap Footed Sleeper Girl - Largest Twin Store & Twin Gift Registry! Dressing baby will be a snap with this one-piece modern baby basic Side-Snap Footie. 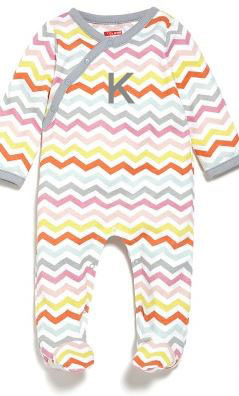 The soft colors and chic chevron print make this baby outfit a wardrobe must-have. 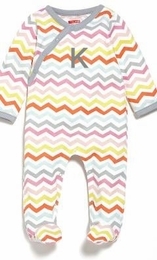 Make this extra special by personalizing it with baby's initial! Coordinate with our baby hat to complete the look! With Personalization: Ships in 3-4 business days. Personalized items are non-refundable and non-exchangable.